So, you are making a cross-country move and wondering what happens to your car? You cannot drive the car to the new destination, it would be too far. So how exactly do you move your 4500-pound car to your new destination? A great option here would be to hire a car shipping company. However, one should be very careful and know certain things before hiring a car shipping company like the cost, timing, and many more things. 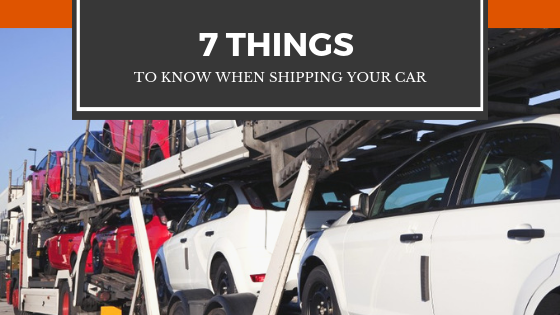 We are here to share with you 7 such things that you need to know when shipping your car. 1. Research about the Company: – Before your hand over your keys to a stranger you need to do proper research and find out everything about the company you are dealing with. Go on the internet, look up what people are saying on the reviews about the company, look up the company website, call them on phone and listen carefully to what they are saying and see if they all lineup. We recommend you reviewing car shippers at sites like Google, Yelp, and Consumer Affairs. 2. Find out what service the company offers: – Call the company and ask what kind of services they offer. Some car shipping companies only operate regionally while others might have a restriction on the size or type of car you have. Also, find out whether they offer enclosed or open car transport service as enclosed services are usually a lot more expensive. 3. You need to wash the car: – Before you give the car to the shipping company to transport, make sure that you wash it thoroughly. One of the main reasons for this is that there might be scratches or dents, and dust will only cover up those scratches. The main reason we recommend you to wash the car is that if there are scratches or dents, you will be able to notice them easily. Also, clean the inside of the car as the car might be jostled a bit and cleaning the inside will avoid damage to the interior. 4. Find out the insurance coverage: – First, check your own insurance coverage and find out how much you are covered and then ask the shipping company about the liability coverage they are providing. Almost all good shippers cover around 50,000 USD to 1,000,000 USD but it won’t hurt to double check. 5. Make sure to leave enough time: – Shipping a 4500-pound car is not as easy as shipping a package. They are slower and more expensive. Domestic shipping usually takes around 3 to 4 weeks while International Shipping can take up to 8 weeks. So make sure to plan well in advance to find a carrier and determine the amount of time that will be required for delivery. 6. Check the tire pressure: – Transporting under-inflated tires or over-inflated tires can be extremely risky as they are on road. If you do not have the tire properly inflated, it will increase the risk of damage to it. Damage to tires usually happen during loading and unloading of the car but if you have the tires properly inflated then there’s nothing to worry. 7. Make sure to lock the car: – Locking the car is such a simple thing yet people forget about it all the time. Once you have the car loaded, there is no reason to keep it open until its delivered. Lock it up and reduce the risk of getting it stolen. Preparing for a car shipping company is not a difficult thing, just keep these 7 things in mind and you are good to go. Good luck! Will The Cloud Replace Traditional IT Infrastructure?